A couple of weeks ago Paul Cyclemon, two friends and I hit the open road for a biking extravaganza o' fun. 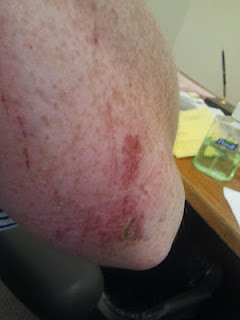 2 hours later my left arm looked like it had been through a meat grinder. And not in the good way. I have fallen on my bike before. A couple of times. But somehow I was able to make those falls look like a rehearsed stunt in one of the Batman movies. As an aside, I saw the latest Batman movie this week. I went into the theater on Monday night at 7:15 and the movie ended 24 minutes ago. And guys, I really really tried to follow what was going on this time. After sitting through the last one, I was mocked for asking, "So was that movie just a remake of Stephen King's It?" I have serious issues with going to movies. I avoid them at all costs, but sometimes peer pressure gets the best of me and I find myself sitting in a dark theater with a group of friends, bouncing up and down the entire time, and attempting to have conversations wholly unrelated to the film with everyone around me. It is for this reason that the 6 people I saw this Batman movie with argued about who had to sit next to me. But I am a grown up. And surely I can behave myself in films and follow the plots just like all the other grown ups. So I really tried this time. Rich guy is sad. Ann Hathaway can beat up gangs of people twice her size who are shooting at her, without any weapons. Giant man is wearing something on his face that makes him have the voice of one of those transformers from that other movie where machines fought the army while Shia LaBiouf made snide remarks about society. Rich guy's body has deteriorated into that of a 90 year old man. This does not stop rich guy from getting into incredibly long and violent fights with transformer the moment he puts on his batman suit. Little boy is really a little girl. Little girl is angry. Yadda yadda yadda. Someone tries to destroy New York City. Nuclear bomb. More fighting. Rich guy hooks up with Ann Hathaway. I can't be sure, but I think I also just described the plot of the last 2 Batman movies. And Brokeback Mountain. Anyway, so back to the bike crashes. Several months ago I came peeling down a road at roughly 20 miles per hour, wind rushing through my hair, cars trailing me, etc., when suddenly Paul Cyclemon JOLTED off of the curb and into the air. Here's the thing about Paul Cyclemon: I love that bike with ever fiber of my being. He and I would be surgically sown together if he wasn't so awkward to have around at formal events. I would even give him a kidney (even though he would probably squander it). But that bike, bless his heart, curls up into the fetal position the moment he smells any sort of trouble. Like, if Paul sees a pebble 500 feet down the road, he immediately throws off the chain, and turns to the right. I am not responsible for this. It's all Paul's doing. So when I went off of the curb, Paul freaked out and forfeited his chain. I hit the curb so hard that I got unclipped, flew off of Paul, and did a triple lutz in the air before landing on my back 10 feet from the road. Nancy Kerrigan would have been a silver gold medalist if that could have counted as my performance in the 1994 Olympics women's single figure skating. Cars slammed on their brakes, and I swear to you, I heard a woman through blood curdling scream, yell from a passenger window, "NOOOOO!!!! PLEASE NO!!!" I stared up at the sky and waited for the angels to come get me. Or, whoever it is that comes to get you when you die. I'm sure someone comes to get you. Otherwise, how else are you supposed to know what to do? Have you ever seen a movie where someone dies, nobody comes to get them, and they just know where to go? Exactly. They always hang around, confused, misunderstood, and with unfinished business. And then sometimes they get inside of Whoopi's body to make out with their girlfriends. But while I lay there trying to have my last thought as a living human NOT be "oh crap! I forgot to wear underwear! The emergency response team is going to think I was so weird!" and be something more about nature and the mysteries of the universe, the angels didn't come. It was a miracle. I sat up, and had not a scratch on me. Even Paul seemed cool with it. Yes I was shaking like a heroine addict needing a fix (not that I know what that is, mom). But I was so not dead. Passersby are still going to group therapy over it. But still, no injuries. But this most recent crash wasn't so graceful. Or exciting. I was merely turning around when suddenly Paul caught the tinsiest bit of gravel, spun out of control, and flopped over onto his side. While I was still mounted. I felt my left arm slide hard on the ground. And all I could think was, I really hope I get a cool battle wound out of this. It was at that moment that I realized I've been doing all of this for the very wrong reasons. I should have just joined a fight club. The slow speed take downs are the worst. No cool story to tell, just a wounded ego and a few bruises and road rash. :) I feel your pain (of body and ego). Well I guess now I don't need to go see Batman . . . I was always incredibly disturbed by that scene in Ghost. It cause me a lot of confusion as a child. Anonymous I am so glad to here that I am not the only one who was disturbed by Ghost as a child. So creepy. You are so confused. But Batman isn't a bad thing to be confused about I guess. And you have purell! You are sure to grow up to do great things in life. I can feel it!